Cloud computing and scalability are often mentioned in the same sentence, but often not when talking about databases. Especially not MySQL databases. A Boston-based startup called ParElastic hopes to change that, and has raised a $5.7 million Series A led by General Catalyst Partners (former VMware CTO Steve Herrod’s new home) to help fund its cause. ParElastic sits in between the application and the underlying database and lets developers scale without having to resort to complicated sharding or maybe even moving the database back in-house where they can run it on a bigger server. Architecturally, Founder and CEO Ken Rugg told me, ParElastic’s Database Virtualization Engine is similar to a parallel database system, although it functions more like middleware that manages multiple database instances as one and is designed for operational rather than analytic workloads. Because it intelligently balances database load and distributed data across servers, ParElastic is ideal for multitenant situations where multiple users, applications or services are accessing the database simultaneously, Rugg added. Now, anyone familiar with the next-generation database market might think they’ve heard this story before, and they kind of have. The NoSQL database movement rode into town on the promise of high scalability, and the NewSQL movement furthered that story by bringing scale-out performance to SQL. Some of these databases are even available as cloud services. However, Rugg explained, there’s a big difference between these options and what ParElastic does. Namely, while NoSQL and NewSQL options require deploying an entirely new database and likely rewriting some application code, ParElastic’s software just overlays customers’ existing cloud databases. 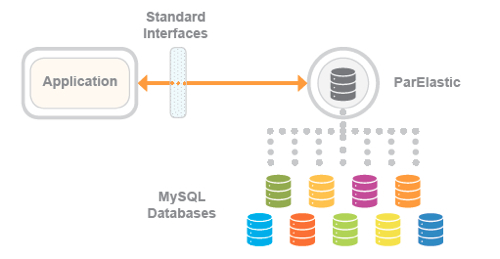 Rugg said about half of its early users are running standard MySQL versions on Amazon Web Services (s amzn), while the rest are spread across cloud providers such as Rackspace (s rax), Joyent and LiquidWeb. However, he said, the biggest beneficiary of ParElastic aside from the company itself might well be AWS. It is by far the most widely used cloud in the world, but when users reach the limites of their single database instances, Amazon usually tells them to look into sharding or perhaps transitioning to DynamoDB. “None of those are really too friendly for Amazon keeping their customers moving forward in their cloud,” Rugg said. Further, although certain cloud providers offer better CPU, IO or network performance than AWS does (Rugg cited Rackspace as being particularly strong on IO performance, for example, and ProfitBricks as looking promising on the network front), “Amazon is sort of the lowest common denominator in a number of ways,” Rugg explained. The economics and performance requirements vary from application to application, of course, but ParElastic could help stitch together a number of commodity AWS instances to provide suitable performance at a lower cost than might be possible using the biggest, fastest instances from other providers. Having watched the cloud market unfold as it has, though, Rugg and ParElastic aren’t banking on AWS — which has a reputation for launching services that compete with startup ecosystem partners — as the future of the business. By supporting other cloud providers that are gaining acceptance (aside from the ones Rugg noted, Google (s goog) has been impressing some with the performance of its Compute Engine service), ParElastic is in a pretty good position to handle whatever cloud-database market shifts might occur. “Even if Amazon comes out and says ‘We’re going to replace you with something we built back in the lab,’ that puts us in a great position in terms of validating the market,” Rugg said. ParElastic’s existing investors — Point Judith Capital, CommonAngels and LaunchCapital — also participated in the Series A round, which brings the company’s total venture capital to $8.7 million.